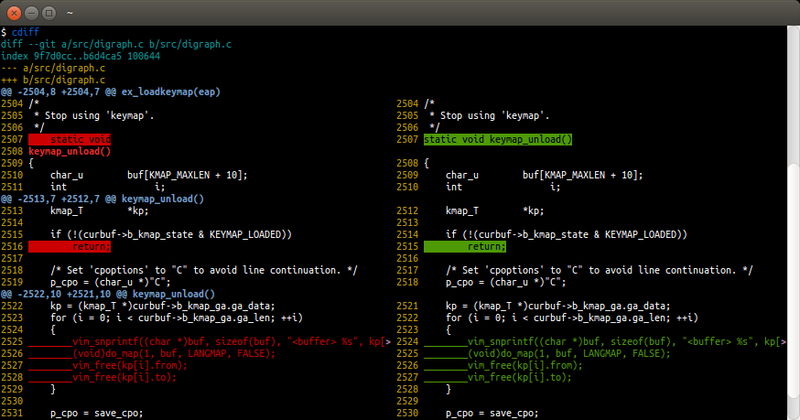 If you use Mercurial, Git or Subversion at the shell, CDiff is a useful tool to have around. By default, hg diff or git diff is displayed in the classic diff format. This shows the before-and-after changed lines one below the other. Personally, I find this very confusing. I very much prefer the side-by-side diff view used in GUI diff programs. cdiff is a great way to get this side-by-side diff view at the shell in full color! Note: Do not confuse this package with the colordiff package that is available in Ubuntu repositories. That is something else! Invoke cdiff in any subdirectory of a Mercurial, Git or Subversion repository. By default, this shows a colorful diff of the changes in all uncommitted files.